Box Text: IT''S A EPIC QUEST OF MAGICAL PROPORTIONS. OF THE LABYRINTH-LINK DUNGEON THAT ENVELOPS YOU AND YOUR FRIENDS. 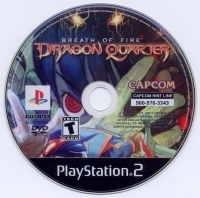 Breath of Fire series for the PlayStation! 03-05-2019 drakeshockfire Box Text IT''S A EPIC QUEST OF MAGICAL PROPORTIONS. YOU LIVE IN ANOTHER TIME... ANOTHER PLACE... DEVOID OF ALL LIGHT SOURCES. YOU ARE NOW PART OF THE UNDERGROUND WORLD. FOIL YOUR MENACING ENEMIES TO REACH YOUR ULTIMATE MISSION. ONLY YOU CAN DISCOVER THE WAY OUT OF THE LABYRINTH-LINK DUNGEON THAT ENVELOPS YOU AND YOUR FRIENDS. REACH FOR THE SKY 3-D worlds evolve based on playing style for a different experience each game An entirely new combined real-time and turn-based battle system Visually stunning cel-shaded subterranean world settings Encounter countless challenges mysticism and healing potions in this action-packed RPG adventure A brand new evolution of the incredible Breath of Fire series for the PlayStation! 03-04-2019 drakeshockfire Box Text IT''S A EPIC QUEST OF MAGICAL PROPORTIONS. YOU LIVE IN ANOTHER TIME... ANOTHER PLACE... DEVOID OF ALL LIGHT SOURCES. YOU ARE NOW PART OF THE UNDERGROUND WORLD. FOIL YOUR MENACING ENEMIES TO REACH YOUR ULTIMATE MISSION. ONLY YOU CAN DISCOVER THE WAY OUT OF THE LABYRINTH-LINK DUNGEON THAT ENVELOPS YOU AND YOUR FRIENDS. REACH FOR THE SKY 3-D worlds evolve based on playing style for a different experience each game An entirely new combined real-time and turn-based battle system Visually stunning cel-shaded subterranean world settings Encounter countless challenges mysticism and healing potions in this action-packed RPG adventure A brand new evolution of the incredible Bream of Fire series for the PlayStation! 08-05-2015 telly Box Text *REACH FOR THE SKY* It's an epic quest of magical proportions. You live in another time...Another place... Devoid of all light sources. You are now part of the underground world. Foil your menacing enemies to reach your ultimate mission. Only you can discover the way out of the labyrinth-like dungeon that envelops you & your friends. 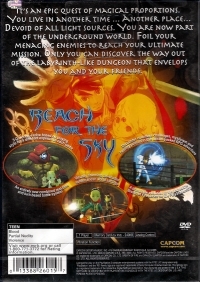 05-29-2012 disgaeniac Box Text *REACH FOR THE SKY* It's an epic quest of magical proportions. You live in another time...Another place... Devoid of all light sources. You are now part of the underground world. Foil your menacing enemies to reach your ultimate mission. Only you can discover the way out of the labyrinth-like dungeon that envelops you & your friends. This is a list of VGCollect users who have Breath of Fire: Dragon Quarter in their Collection. This is a list of VGCollect users who have Breath of Fire: Dragon Quarter in their Sell List. 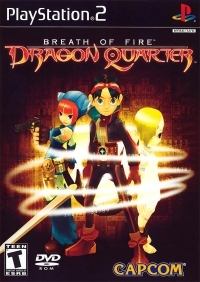 This is a list of VGCollect users who have Breath of Fire: Dragon Quarter in their Wish List.